First things first, get your tuxedo clothing together. 1.) Tux coat: I purchased this from Goodwill because I didn’t want to destroy a black suit coat. However, if you have an old one that never gets worn, pull it out of the back of the closet and get out the scissors! Cut the bottom of the suit to give it a tux look. On the coat, start under the arms about where the middle of your torso is. Draw a diagonal line from this point toward where your belly button is. Now cut. The back of the coat should be short in the back, cut at the same level where you started your mid-torso cut. If you are confused (because this sounds more confusing that it is), look at a picture of Akeem. I don’t sew, so I didn’t worry about the hem. Just make sure now loose strings are hanging down. 2.) Pants and Button Down White Shirt: These two articles of clothing follow the rule, “Borrow, Don’t Buy.” Hopefully this is self explanatory. Most guys have a white button down and pair of black slacks/suit pants so borrowing probably isn’t necessary. 3.) Bow Tie: Once again “Borrow, Don’t Buy!” My boyfriend was buying a new tie online around this time. The website had bow ties on sale in for only $3. So I ignored my own “Borrow” rule on this one, (tsk, tsk, I know). Ask around and see if you know anyone who owns a tux. Hopefully someone will. If I hadn’t found my online steal, I would’ve just borrowed one from my dad. Just make sure to put on your pretty-please face, and reassure them the tie will not be altered in any way. Don’t worry about the color, just find one that’s Black or White. 4.) Fur Cat (to go on tux coat): If you are lucky enough to be a parent to a child with millions of stuffed animals, you may have a stuffed jungle/safari cat already. Hopefully you’re child won’t be too terribly devastated if you cut it up. I found mine at Goodwill for a couple bucks. Now, pluck out all of the stuffing. Cut along the seams and make the lion as flat as possible. If you look up close, my lion had legs and body parts rearranged. This little guy was not at all anatomically correct after I was done with it. The head placement is really the most important part because it’s the focal point. I don’t have a sewing machine, so I just threaded a needle and stitched the lion to the coat. Once again, it can be sloppy (mine sure was!). You just want to attach it as quick and dirty as possible. I promise, noone will notice. 5.) Gold Crown and Necklace: It’s Crafting time! At this point we switch to our “Look Around the House” motto. The only thing I had to buy for this was gold spray paint. I didn’t use any special brand or sheen. I just bought the cheapest one I saw. Crown: You need thick paper or thin cardboard. I used a cereal box and cut it up. Other susbsitutions you can try are: gift box cardboard, poster board, brown paper sacks, old greeting cards tape together, etc. etc. Just look around your house! I promise you have something. To make the crown, pretend you are back in kindergarten. That’s how I came up with my pattern. I stapled my ends together, but tape will also work. Just remember to measure it on your head before closing the circle. Necklace: For the necklace, I did the same…looked around the house and found thick cardboard. Cut out circles, squares, and triangles. I made them in difference sizes. You will need to make them in pairs. Make one big shape to go in the center. Then just start stringing on the shapes. One of the two pairs per side of the necklace. It needs to be symmetrical. For string, say it with me: LOOK AROUND THE HOUSE! Do you have fishing line? Twine? Yarn? Dental Floss? Trust me, you will have something. Embellishments: Obviously, you know how I found these (hint: I looked around my house). I used the following: drinking straws, buttons, and toothpicks. Just cut them up to look like bits of whatever. I didn’t really have a method. Everyting was randomly placed. Just shoot for the tacky and gaudy look, and you will nail it! Glue all your bits of junk on, and let dry. 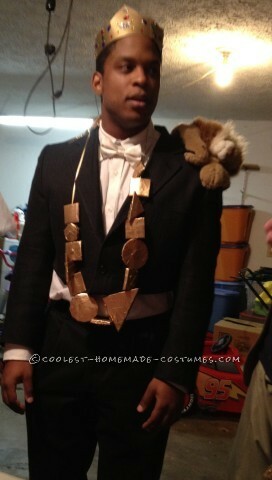 Lastly, spray the necklace and crown with your gold paint. I needed two coats and one can of paint was more than enough. For the crown’s jewels……well, I know you know how to find these! 6.) Eddie Murphy-esque mustache. These are really easy and cheap to find. But if you can’t find one, get a sharpie or black eye-liner and draw it on. Voila! Done and Done. Cheap and easy. The only downside was that if you are going to a party with people under 30, there will be plenty of people who have no idea who you are. *Free: Assumes you have borrowed or have around the house.